Born to the Korean nobility; his parents were converts to Christianity, and his father was martyred. Andrew was baptized at age 15, then travelled 1,300 miles to the nearest seminary in Macao, China. While still in seminary, he travelled back to Korea to work in the missions, travelling with Saint Marie-Nicolas-Antoine Daveluy. Ordained in Shanghai on 17 August 1845 by Bishop Jean-Joseph-Jean-Baptiste Ferréol who was en route to Korea as its new Vicar Apostolic. Father Andrew became the first native Korean priest, and the first priest to die for the faith in Korea. Leader of the Martyrs of Korea. O God, You have created all nations and You are their salvation. In the land of Korea Your call to Catholic faith formed a people of adoption, whose growth You nurtured by the blood of Andrew, Paul and their companions. Through their martyrdom and their intercession grant us strength that we too may remain faithful to your commandments even until death. Amen. Born to a wealthy, aristocratic, and pious family; the daughter of Philophorm and Theodosia, Christians in a pagan world. Consecrated virgin who used her fortune to aid the poor. Ordered to sacrifice to a statue of Ares, she refused. She was imprisoned and tortured, but repeatedly was miraculously healed. When her example had strengthened her companions and converted all of the pagans who would listen, include Saint Sosthenes and Victor, she died. Martyr. Bishop. Reluctant 21st pope, elected after a year-and-a-half period during which the persecutions were so bad that papal ascension was a quick death sentence. Worked to maintain unity in a time of schism and apostasy. Fought Novatianism and called a synod of bishops to confirm him as rightful pontiff, as opposed to the anti-pope Novatian. Had the support of Saint Cyprian of Carthage and Saint Dionysius. He welcomed back those who had apostacized during the persecutions of Decius; the documents that settled this matter prove the final authority of the Pope. Exiled to Centemcellae in 252 by Roman authorities to punish Christians in general, who were said to have provoked the gods to send plague against Rome. Martyr. A document from Cornelius shows the size of the Church in Rome in his papacy: 46 priests, 7 deacons, 7 subdeacons, approximately 50,000 Christians. Son of a chieftain of the Cumbrian Britons. His father was a convert to Christianity, and Ninian was raised a Christian. Studied in Rome, Italy for fifteen years under the direction of Pope Saint Damasus I. Priest. Bishop, consecrated by Pope Saint Siricus c.394. Friend of Saint Martin of Tours. Returned home to evanglize his region, working with the Britons and Picts, and helping lay a solid foundation for the Church in Scotland. With help from masons from Saint Martin's abbey, Ninian built his great monastery, the White House c.397, so called because the stone work was unusual in an era of wooden churches. It was probably the first Christian settlement in Scotland, became the centre of his work, is now known as Whithorn Abbey, and is one of the holiest places in that country. Miracle worker, known to have cured a neighboring chieftain of blindness. Saint Aelred wrote a biography of him, and Saint Bede mentions him in the history of early evangelization in the Isles. His tombs, and a nearby cave where he used to retreat for prayer and meditation, are still places of pilgrimage. Born to the French nobility. Canon lawyer. Bishop of Maguelonne, France in 1418. Advisor, courtier and diplomat in service to Pope Martin V. Archbishop of Arles, France in 1423. Created Cardinal-priest of Sante Cecilia in 1426. Important member of the Council of Basle in 1436, leading the party that maintained the supremacy of general councils over the pope, and working to forward the decree of the Immaculate Conception of Our Lady. While he was there he worked with victims of a plague outbreak. In 1439, in a misguided attempt at Church reform, Allemand was primarily responsible for the election of Anti-Pope Felix V, which led to Pope Eugenius IV excommuniting them both. Allemand consecrated Felix as bishop, then crowned him as pope, and served as a papal diplomat. He was also primarily responsible for ending the schism by convincing Felix to abdicate. Pope Nicholas V was elected; he restored Allemand to all his honours and offices, and made him papal legate to Germany in 1449. Vatican politics aside, Allemand was always know for his strong faith, personal piety, and as dedicated shepherd of his dioceses. Son of Prince Landolfo V of Benevento, Italy. He felt an early call to religious life, but as he was the only son, his family opposed his vocation. He fled an arranged marriage, was brought back by force, and escaped again; his family finally gave in. Monk at San Sophia monastery, Benevento, taking the name Desiderius. Monk at Monte Cassino at age 30. Abbot of Monte Cassino. Cardinal in 1059. Worked closely with Pope Saint Gregory VII. Chosen 158th pope in 1086; he was so reluctant to accept that his coronation didn't take place for nearly a year, and then he retreated to Monte Cassino. 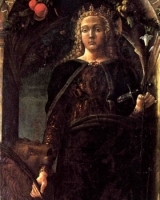 Countess Matilda of Tuscany convinced him to return to Rome, Italy, but because of the strength of force of anti-pope Clement III he soon fled again. In August 1087 he held a synod at Benevento which excommunicated Clement III, forbade lay investiture, and proclaimed a Crusade against the Saracens in Africa. We have no information about the life, nor specifics about the death of this martyr. Tradition says that her relics were miraculously found by a Spanish shepherdess in the late 11th century. Devotion began immediately due to the miraculous healings caused by the intercession of Saint Euphemia. To fill in the gaps in ther story, beginning in the 16th century there were many “lives” written about her, and many of them confuse her with Saint Euphemia of Chalcedon, but no real information about the life of this Saint Euphemia has survived. 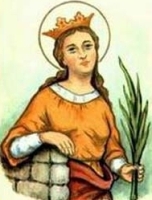 Daughter of King Edgar the Peaceable and Saint Wilfrida. Raised in the abbey in Wilton, England, which she never left. Educated at the royal court, learning to read, write, illuminate manuscripts, sew and embroider. Benedictine nun from age 15. Offered the position of abbess at three houses, and her father's throne, but she refused them all. Built the Saint Denis Church at Wilton. Had a gift for communicating with wild animals. Saint Dunstan nursed her during her fatal illness, having received a vision of her passing. Daughter of a Slavic prince. Duchess of Bohemia, married to Boriwoi, first Christian Duke of Bohemia; the two were baptized by Saint Methodius in 871. They built the first Christian church in Bohemia, and tried to force Christianity on their subjects; they failed. Widow. Grandmother and tutor of Saint Wenceslaus of Bohemia. Gave a proper burial to Saint Ivan. Her daughter-in-law, Drahomira, jealous of the influence which Ludmilla wielded over her grandson, Wenceslaus, had her murdered. Born to a pious and impoverished Spanish noble family. Orphaned young, he worked as a shepherd. Worked on a South American cattle ranch around Cartagena, Colombia. Dominican lay brother at Lima, Peru, received by the house on 23 January 1622. Worked as porter or doorkeeper for his friary for over 20 years. Noted for visions, for his care for the poor of Lima, and for his endless praying of the Rosary, offering all his prayers for the release of souls in Purgatory; traditions says that he freed over a million through his prayers. Friend of Saint Martin de Porres. Son of Raimondo Casanovas Brunet and Maria Perramón Oliveras; he was baptized at the age of one day. Joined the Piarists on 21 November 1909, making his solemn vows on 30 August 1914. Ordained a priest on 17 September 1916. Worked in the Spanish cities of Terrassa, Vilanueva, Olot and Barcelona. Martyred in the Spanish Civil War. Priest in Rome, Italy. Arrested with Saint Abundantius for refusing to sacrifice to Hercules. Tortured at Mammertine prison, and condemned to death for their Christianity. On the way to execution the two passed Senator Marcian who was grieving over his son John who had just died. Abundius prayed over John, and the boy returned to life; Marcian and John converted to Christianity on the spot. Martyr. Vitalis gave up wealth and a position in the landed gentry to become a hermit, monk and then abbot of 140 Benedictine brother monks at the monastery in Savigny, Normandy, France. Friend of Saint Robert of Arbrisselle. Vitalis successfully worked to evangelize the area around the monastery. Son of Saint Marcian the Senator. Died of unknown causes, but was brought back to life through the prayers of Saint Abundius. He immediately converted to Christianity, and was immediately condemned for his faith. Martyred with Saint Marcian the Senator, Saint Abundius, and Saint Abundantius. Virgin martyr. Nothing else is known about her for sure, but her name has been entwined with the stories of many other martyrs. 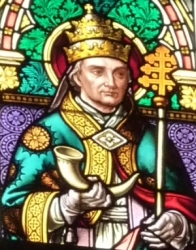 Father of Saint John. Imperial Roman senator. When Saint Abundius brought Saint John back from the dead, Marcian converted to Christianity on the spot and just as quickly executed for it. Martyr. Dominican lay tertiary. Sheltered missionaries during the persecutions in Japan. Martyr. Married lay man. Father of Blessed Paul Himonoya. Convert. Member of the Lay Dominican tertiary. Ordered by authorities to renounce his faith; he refused. Martyr. Born to the nobility, the daughter of Duke Adalbert of Alsace (in modern France. 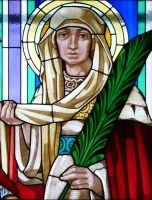 Niece of Saint Ottilia of Alsace. Nun. Abbess of Hohenburg Abbey. Deacon in Rome, Italy. Arrested with Saint Abundius for refusing to sacrifice to Hercules. Tortured at Mammertine prison, and condemned to death for their Christianity during the persecutions of Diocletian. Martyred. Son of Blessed Michael Himonoya. Dominican tertiary. Ordered by authorities to renounce his faith; he refused. Martyr. Servant and spiritual student of Saint Rogellus of Cordoba, and murdered by Moors with him for opposing Islam. Martyr. Monk in Spain. After preaching against Islam, he and his student, Saint Servus Dei, were murdered by Moors. Martyr. Woman in 1st century Phrygia, Asia Minor. Convert, brought to Christianity by Saint Paul the Apostle. Imprisoned, tortured and martyred in the persecutions of Domitian. Monk at the monastery of Huerta, Castile, Spain. Bishop of Sigüenza, Spain for several years before finally retiring back to his monastery. A convert, she was imprisoned and tortured during the persecutions of Diocletian while still a neophyte. Baptized in prison. Martyr. Monk. Spiritual student of Saint Humbert of Pelagius at Maroilles Abbey near Cambrai, France. Abbot of Maroilles. Married. Widow. Tortured and martyred at age 75 in the persecutions of Diocletian. Abbot of Saint Peter's Abbey in Perugia, Italy. Benedictine abbot at Maroilles, diocese of Cambrai, France. Four Christian men martyred together, date unknown - Alexander, Felix, Papias and Victor.